After a year of hard work at my job, plus school, races, kickball leagues, social life, bla bla… It is finally time for my VACATION! I’m going to Thailand for 2 weeks and I could not be happier. It will be my first time in Asia and I’ve been dreaming about this day since I came back from my last backpacking trip to Europe in 2012. Planning trips is a lot of work, but it is one of my favorite things to do. Most of my vacation time is used up going to Brazil to see my family, and for that, no planning is required. All the other times I have the opportunity to go travel, Skyscanner, The Flight Deal and the good ol’ Google are my favorite sites for research. The one thing that changed majorly from 2011/2012, when I planned my 2 month Europe excursion, to 2015, is that physical travel guides are no longer my go-to. RIP Rick Steves’ guides! It was funny when I realized only a few days ago, that I am about 3 months into planning, and I haven’t touched a book. In 2011 when I started planning Europe, I went to my local library and got about 4 travel guides. After spending an afternoon going through them all, I took some notes and chose my favorite book (and of course, my destinations in Europe). I ended up buying that book on my Kindle, and taking it with me to the old continent. Just about everyone and their mom have a travel blog these days. Kids are leaving their corporate 9-5 job to live abroad, write a blog and collect revenue through ads and authority outreach. I can’t say I’m not jealous, they are living the dream and getting paid for it. In the end, I’m grateful because they make my traveler life a lot easier. Marek convinced me to go to Thailand. Kate chose Ko Lanta as my island destination. Steph even helped me pack. Guess who chose my itinerary? Yup, you are right. Many, many blogs read in the course of the last 3 months. Thanks, guys. Adventurous Kate left her job and became a full time traveler. 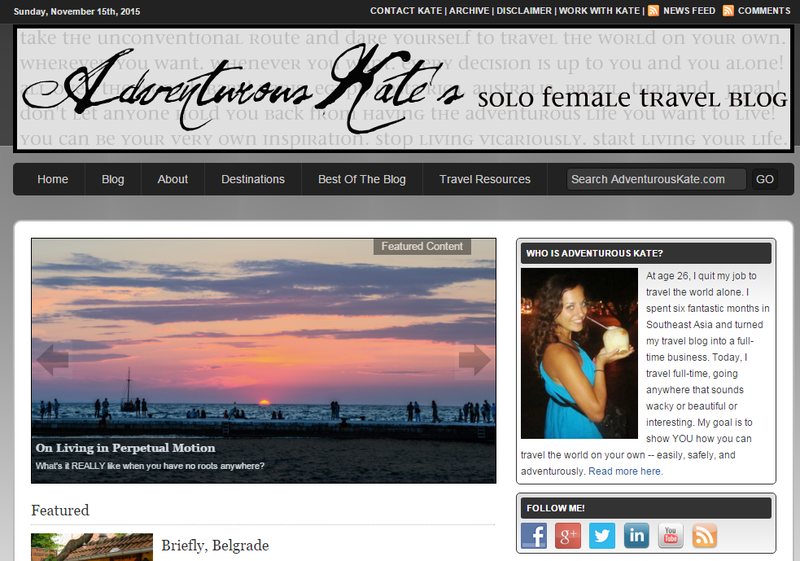 Her blog is her income, and her life is full of adventure. Plus, she helps other travelers. Pretty amazing! Oh, the word of mouth. The amount of time I spent reading reviews about hotels, activities, tours, restaurants and even transportation was no joke. It’s almost like every travel related question that I could think of it was already answered on Trip Advisor. I could not book any hotel or tour before reading reviews on Trip Advisor. These reviews are a great example of a modern day word of mouth. According to Nielsen, 92% of consumers believe recommendations from friends and family over all forms of advertising. An opinion from a random person is still better than no opinion. Technology has increased social connectivity making it easier than ever for consumers to do your marketing for you. A post that takes just a few minutes for a fan to write will be seen by hundreds of friends who trust them, and it can rapidly travel out to thousands more. The “modern day word of mouth marketing” directly influences brands and their reputation, and it is valuable to develop brilliant strategies as marketers. Facebook secret groups are the biggest reason why I use Facebook. I am currently active on a group for girls from San Diego, where I live, Girls in general discussing girl problems, people who love to cook, people who likes to run marathons, and… girls who travel. It was so easy to find answers to any questions I have about my destination. According to this article, there are actually three of the possible types of groups on Facebook: public, closed and secret. Screenshot of my favorite Facebook travel group. I learn so much from these posts! Marketers are starting to realize how important these groups are for creating a buzz for their product. 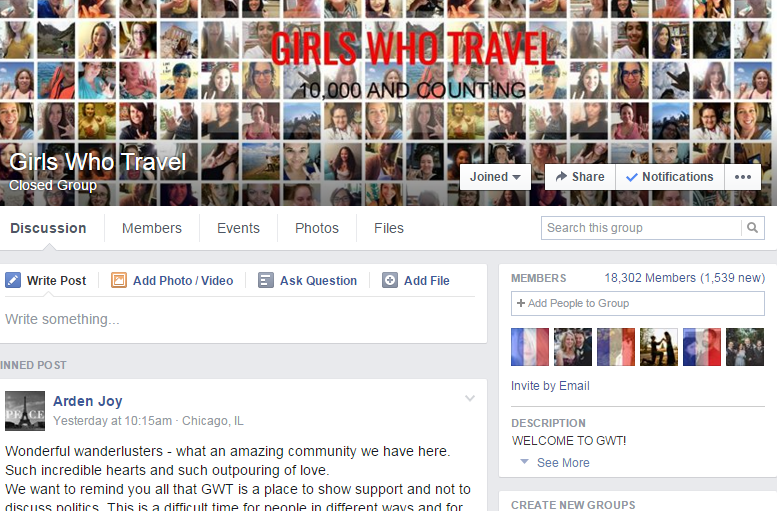 In fact, many of the girls that answered my questions about my trip on the Travel Facebook group are there to promote their travel blogs. As a marketer, you can use the Secret Group to strike the balance of getting and receiving ideas, data, industry insights, or whatever information that can be useful for you and the secret members—to listen and at the same time share your marketing mojos for growth and success. As a traveler, I have to say that knowing from other travelers with similar interests made my trip planning a lot easier! This entry was posted in Uncategorized and tagged facebook groups, travel blogs, travel planning. Bookmark the permalink. I am a person who constantly looks to travel blogs to see where other people are traveling and what types of tips they may have when going abroad. As a frequent traveler myself, I find it to be really important. If there is something I want to learn about, I want to learn about it from other people who have experienced firsthand. It is easy to see how marketers also find this information useful. I love how easy emerging media has made travel planning. From the weather apps that help you figure out what to pack to the airline apps that allow you to check-in to your flight, traveling has never been so hassle free – at least on the digital side of things.